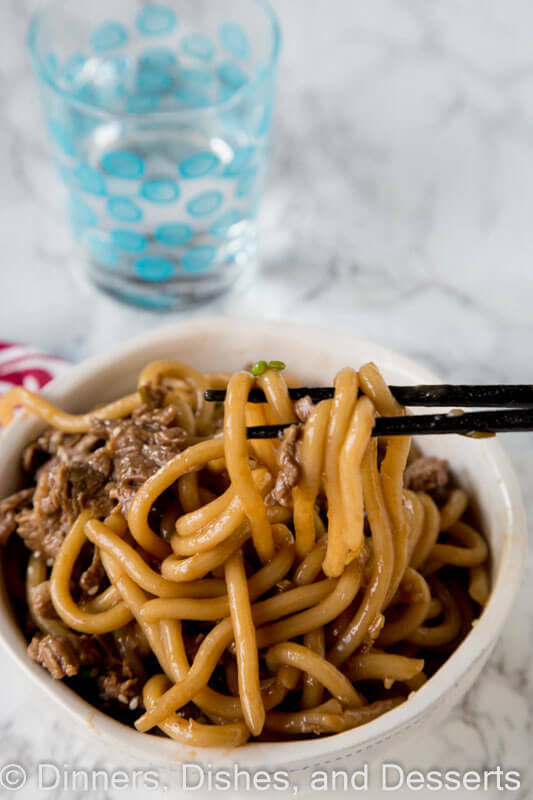 Garlic Beef Noodle Bowls – an Asian style noodle bowl with lots of garlic, that is ready in just minutes! Great for busy nights. We just got back from a quick weekend in Wisconsin. It was a long drive for a weekend, but it was worth it. We had my grandpa’s funeral on Saturday and spread his (and my grandma’s) ashes afterwards. We looked at flights, but it was at least $600 a person for us to fly. So we drove the 14 hours each way. We have done that drive many times, so it wasn’t horrible, but usually we are there for longer, so it doesn’t seem as bad. Are you a road trip family? Or will you fly no matter what the cost? I really wanted to fly, but when I added it up, I just couldn’t do it! Last minute prices are just brutal. I am kind of excited for these garlic beef noodle bowls today. 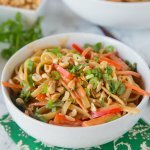 I have made these noodle bowls a few times for my family, and they absolutely love them. 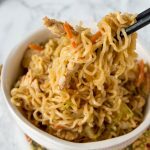 Anything with garlic and soy sauce is kind of a hit at our house; Chow Mein Noodles with Chicken is on repeat around here. This Pepper Steaks looks like a must try for sure. What noodles you use, is pretty much up to you. 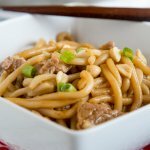 I used udon noodles this time, but you can use lo mein, linguine, Chinese egg noodles, or pretty much anything. Costco sells a package of udon noodles in their refrigerated section, we love them. It comes with 6 small packages of noodles inside. 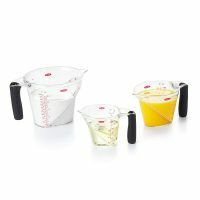 I use 4 of them to make this recipe. 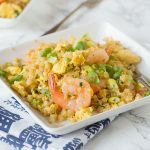 They cook in about 2 minutes, so are perfect for a quick and easy dinner. 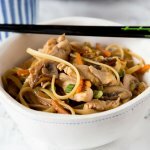 If you have Lo Mein on hand you can also make Chicken Lo Mein for an easy dinner. I love dinner that is ready in minutes. 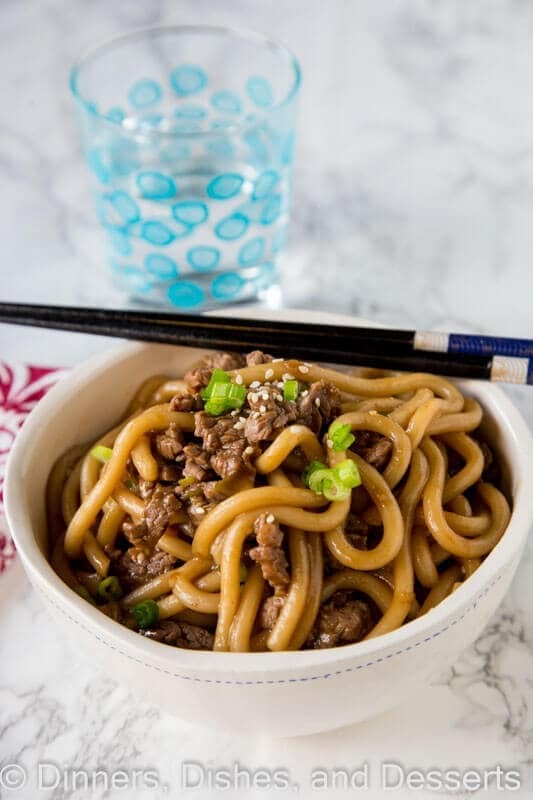 These garlic beef noodle bowls come together in about 15 minutes, which is perfect for busy weeknights. Slicing the beef takes the most amount of time. 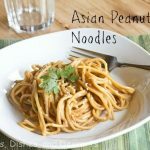 Depending on the noodles you use, they can be done in anything from 2-10 minutes. Don’t have noodles? Try Mongolian Beef. While they cook, you make the beef. Then mix it all together for a minute before you serve. 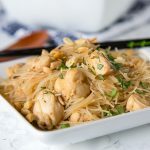 Sometimes Asian style recipes can call for hard to find ingredients, but this uses only things you will find in your local grocery store. Soy sauce and sesame oil are the most “exotic” ingredients called for. Even with common ingredients, you get a super flavorful and delicious dinner. I have made this at least 3 times already, and it is already being requested again. 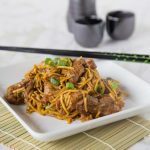 Garlic Beef Noodle Bowls - an Asian style noodle bowl with lots of garlic, that is ready in just minutes! Great for busy nights. Heat oil over high heat in a large skillet. Once hot, add beef strips. Cook for 2-3 minutes, until beef is browned. Add garlic and ginger to the pan, cook for 1 minute until fragrant. Add soy sauce mixture to the pan. Bring to a simmer, and cook for 3-5 minutes until sauce slightly thickens. Add cooked noodles to the pan, stir to coat. Sprinkle green onions and sesame seeds over the pan to serve. Sorry you guys weren’t able to fly, but SO glad you were able to attend your grandfather’s funeral. I hope it was a beautiful service. 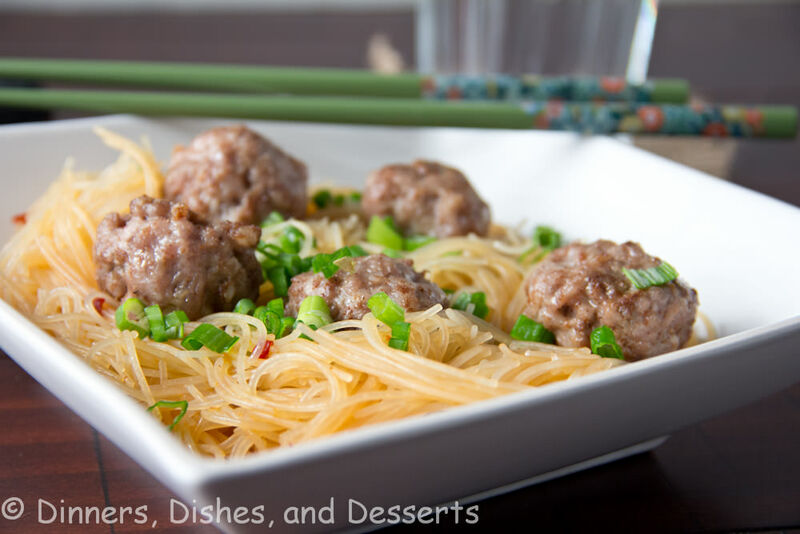 <3 These noodle bowls look absolutely delicious!! 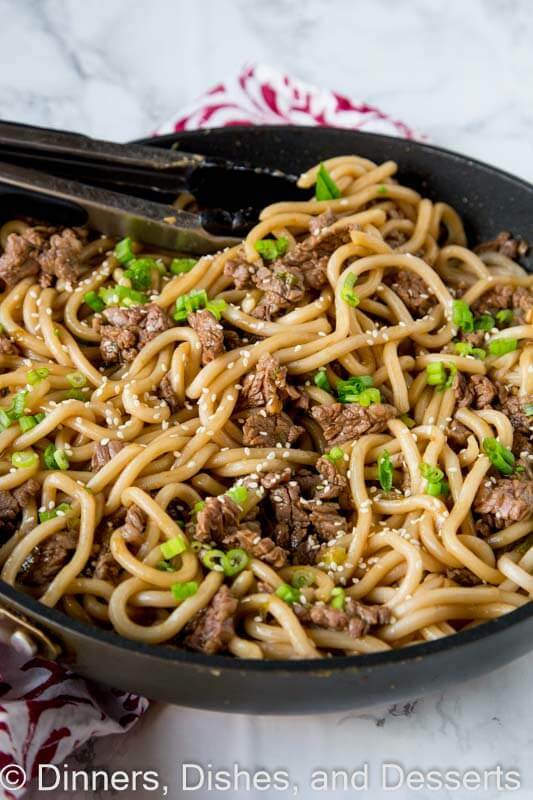 Garlic beef plus noodles is my idea of dinner winning! 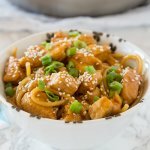 Thank you so much for including my Honey Ginger Garlic Chicken Carrot Noodle Bowls in your "other recipes you might like"! I'm honored. Cheers to a wonderful weekend! P.s. while I prefer to fly, at that price I would have driven too! Thank you Cheyanne! The drive wasn’t too bad, we broke it up some. Definitely worth saving the money! 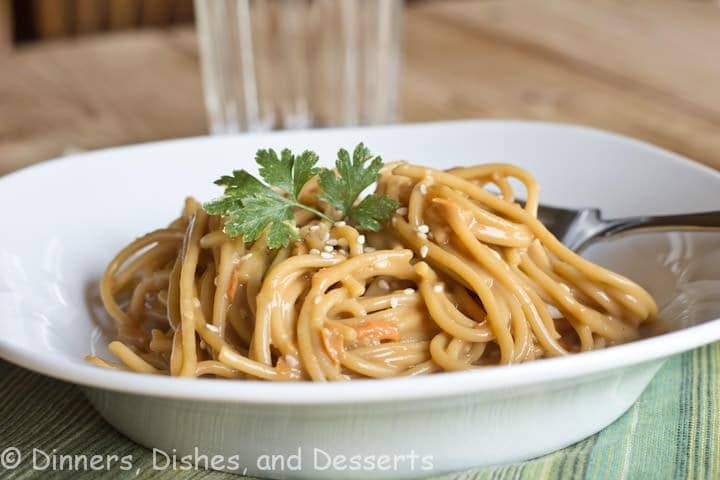 Thank you for sharing this recipe…it was sooo good … definitely make it with low sodium soy sauce next time tho …it was a bit salty for us. I made this tonight for dinner. The grandkids loved it. Ask if we could have it again tomorrow. That is great Patti! Thanks for letting me know! It is on the menu here tomorrow night too! Based on the picture, do you pull-apart the steak strips a bit? I like to slice the steak and then just cook it. 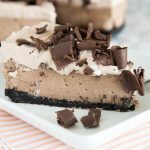 You can cut it in chunks, bite size strips or whatever size you like – it will all work great. Enjoy! Just made this for the first time and it was SO delicious! I added some crushed red peppers flakes for a little spice. Thanks for sharing! 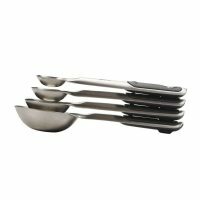 4-5 depending on serving size. While my husband and I loved it… my kids not so much. I added some broccoli to the recipe, it was delicious. I will be making this again, even if my kids were/are not fans. While it’s a shame about their passing, why on earth are you posting about your dead grandparents when it literally has nothing to do with this dish? It’s creepy and extremely off putting. If you need to vent about their passing do it somewhere more appropriate, not on a food/recipe page. This is a blog, not the the Food Network website. So I get to write about my life and what is going on at the time. I pay to maintain the website and all the costs associated with it. I get to pick what is write about. And of the whole post there is 2 sentences? Skip it if you don’t want to read it. I understand that, but if you felt the need to talk about them then why not make a blog entry just about your grandparents? It would be more tactful. Leah- You are extremely rude. I find you creepy and off putting. If you need to vent about your dislike do it inside your own head where it’s more appropriate. No, I would’ve been rude if I said something like “no one cares about your grandparents passing, just tell us the recipe.” I didn’t though, I expressed my condolences and simply stated my opinion that there are more respectful/tactful ways to talk about your family members passing than writing about it in a food blog entry. I appreciate you copying me though. You go girl! Your recipe is great & so are you. Post whatever you wish on your great site! My five-year-old and I enjoyed making this dish! She asks for asian-inspsired dishes all the time. Trouble is, she gets hives just looking at peanuts. 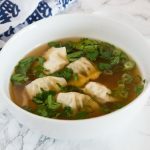 So finding a recipe made with simple ingredients we can track to the source (unlike hoisin, fish, or oyster sauce) is essential to her wellbeing. The whole family loved the noodles and I’m sure it’s a dish she’ll make to safely satisfy her lo mein cravings well into the future. Thank you for posting! Delicious and easy recipe. Please ignore the ignorant…My condolences on your loss. Thanks for sharing. Substituted honey for the brown sugar and added some sriracha for a kick. 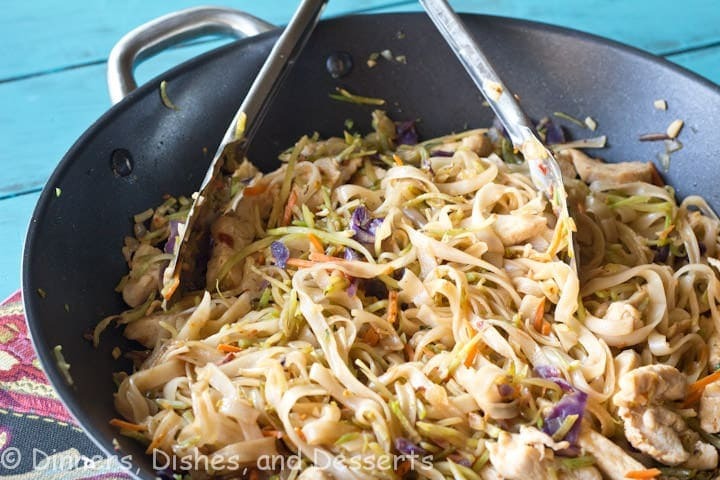 Going to try using rice noodles next time. Yum! I want to add some blanched broccoli to this dish. 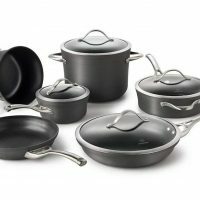 Should I make I little extra sauce OR is amount in recipe sufficient to coat all the ingredients? The picture looks so appetizing; I’m gonna make it today. Hazel, You will probably be fine with the sauce. But my family tends to like things extra saucey, so I would probably make just a little bit extra to mix in. Enjoy! Erin, thank you so much for responding. I added about 1 1/2 cups of blanched broccoli florets and I increased sauce by half and it was sufficient coverage. It was very yummy. Thank you for recipe. 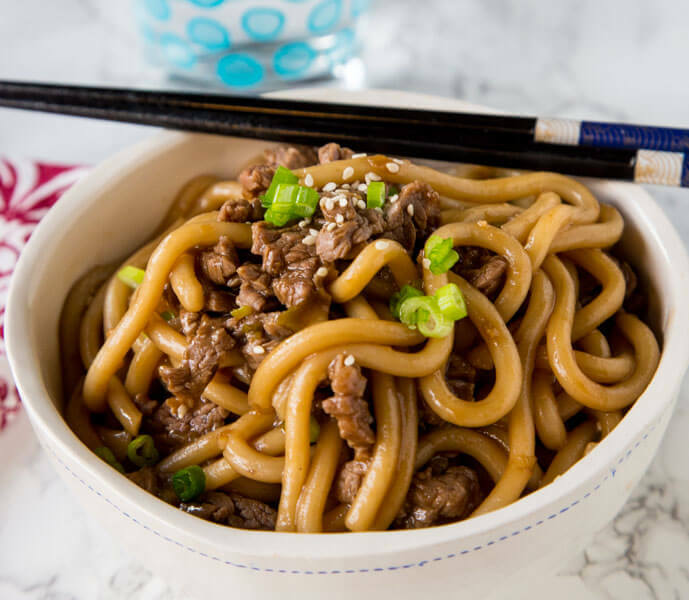 I’m craving these noodles, they look so yummy! Fun! I grew up right outside of Madison, you? 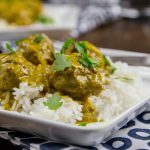 I need to make this for dinner tonight! This is all the comfort! And five stars! What a recipe! 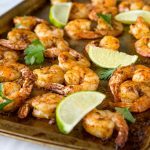 Such a perfect weeknight dinner! Love all that garlic! Love this dish! My kids are so excited about it! This dish totally saved our dinner! I had cooked up some udon noodles to go with another dish, but then it turned out that I was missing a few main ingredients that I thought I had. 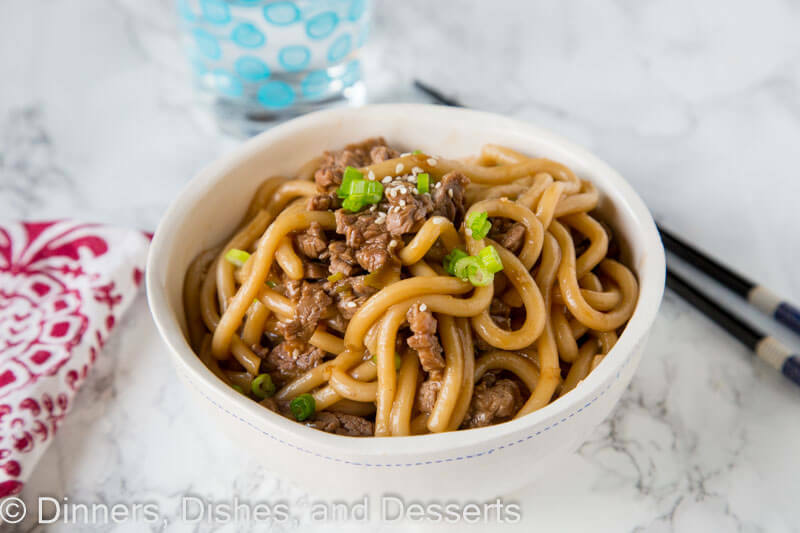 SO… I quickly hopped onto Pinterest, searched Udon Noodle Recipes, this popped up & I decided to try it since it looked good & I had all of the ingredients. Thank you for the delicious recipe. It’s now going to be a regular in our home. Also, taking a 14 hour trip twice in a weekend is brutal! But I wouldn’t have dished out $600 per person for plane tickets either. Even if it was just my husband & me. Whew! 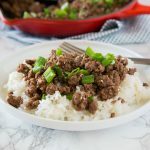 Can you substitute ground beef for the steak? I have not done so, but it should work. It will definitely though.